Last major update issued on March 15, 2006 at 04:30 UTC. The geomagnetic field was inactive to quiet on March 14. Solar wind speed ranged between 343 and 428 (all day average 377) km/sec. 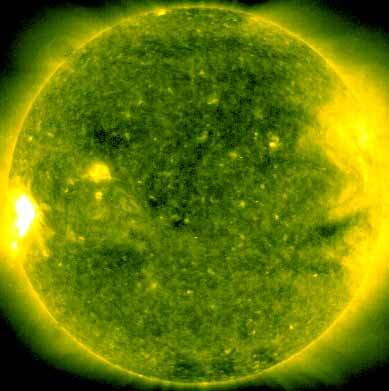 An increase in solar wind speed and density was observed late in the day as a weak disturbance began. Solar flux measured at 20h UTC on 2.8 GHz was 73.6. The planetary A index was 4 (STAR Ap - based on the mean of three hour interval ap indices: 3.9). Three hour interval K indices: 00012222 (planetary), 00112202 (Boulder). 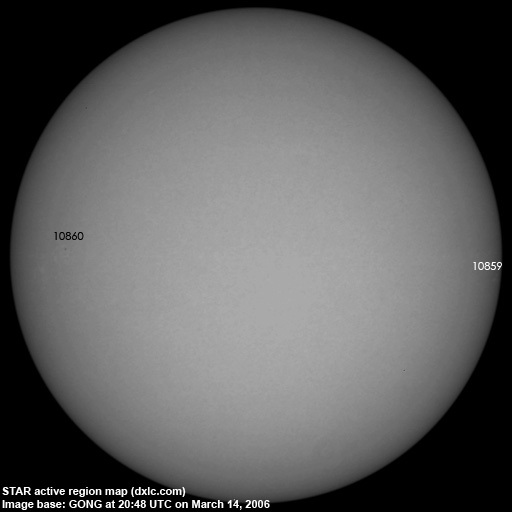 New region 10859 emerged in the southwest quadrant on March 13 and was numbered the next day by NOAA/SEC. The region is rotating over the southwest limb. New region 10860 rotated into view at the southeast limb on March 12 and was noticed 2 days later by SEC. The region produced a few sub flares during the day. March 12-14: No partly or fully Earth directed CMEs were observed in limited LASCO imagery. 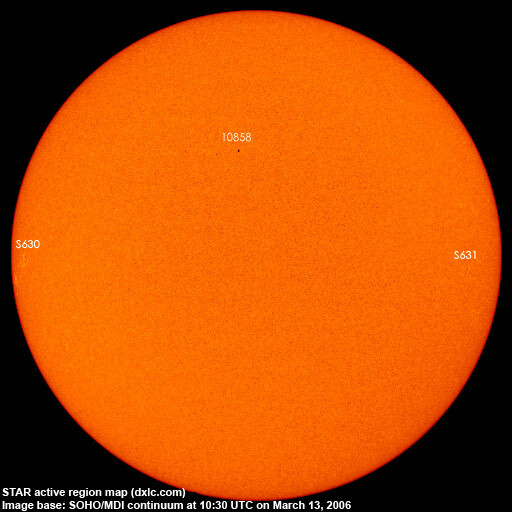 The geomagnetic field is expected to be quiet to active on March 15 and quiet to unsettled on March 16-18. Long distance low and medium frequency (below 2 MHz) propagation along east-west paths over high and upper middle latitudes is poor. Propagation on long distance northeast-southwest paths is poor. Trans Atlantic propagation conditions are normally monitored every night on 1470 kHz. Dominant station tonight: Radio Vibración (Venezuela). Propagation was fair early on to the easternmost parts of North America, however, reception deteriorated as the current disturbance intensified.